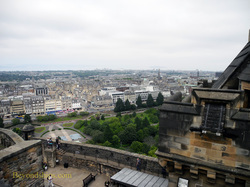 Edinburgh Castle can be roughly divided into two parts. There is the lower part (also called the Lower Ward), which has more of the character of a Georgian/Victorian fortress than a medieval castle. Then there is the upper part of the Castle at the top of the hill (the Upper Ward), which has more of a medieval flavor with the Royal Palace, the Great Hall and St. Margaret's Chapel. We will begin this tour with the lower part of the Castle. The upper part will be explored on the next page. Visitors enter (and exit) the Castle through the Gatehouse on the east side of the Castle. The structure we see today only dates from the late 19th century and was part of a re-modeling effort that sought to make the Castle look more castle-like. Nonetheless, it does make for an impressive entrance and looks quite dramatic when soldiers and bands sally through it during the annual Military Tattoo. Once inside you proceed up a steep road to the Portcullis Gate. 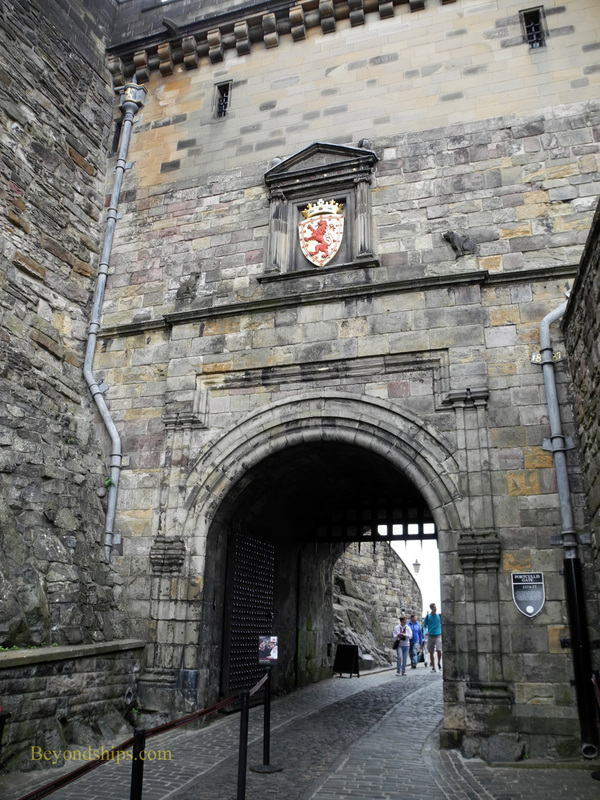 This gate dates from 1573 and was a formidable defensive position. 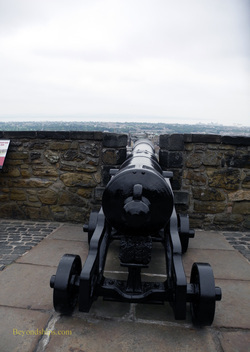 Several batteries were constructed to defend the Castle. 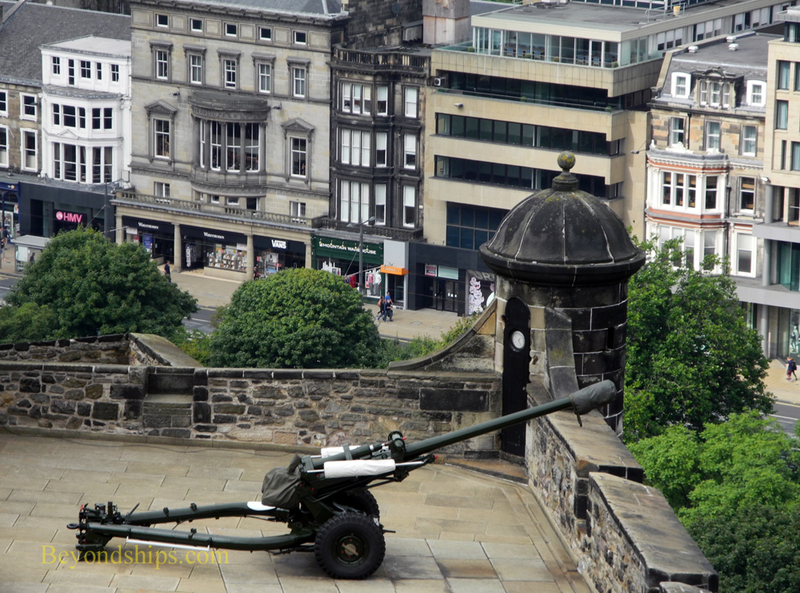 The first one visitors encounter, the Argyle Battery, has a display of Napoleonic-era cannons (right). The modern field piece in the Mills Mont Battery is the One O'Clock Gun, which is fired every day (except Sundays, Christmas and Good Friday) to announce the time, a practice that has gone on since 1861 (left). Dominating the lower part of the Castle are two large buildings. The New Barracks (above left) was built in 1799 and could house a full infantry battalion of that era. It is still used by the military and only one section (a museum) is open to the public. 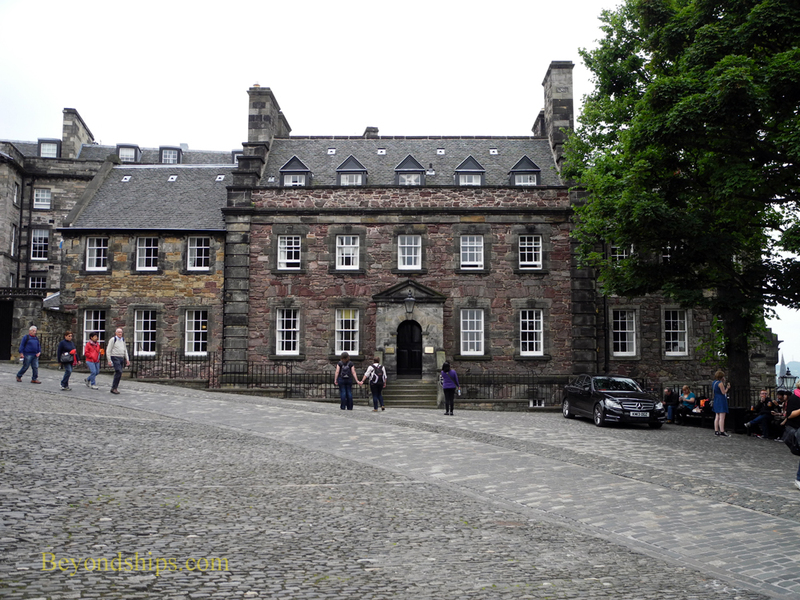 The Governor's House (above right) dates from 1742 and is the residence of the Castle's governor. It is not open to the public. The Castle houses three main museums as well as several other exhibit areas. 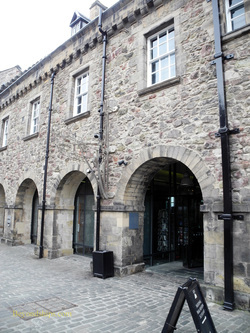 The National War Museum (left) documents Scottish military history from the 17th century to the present. 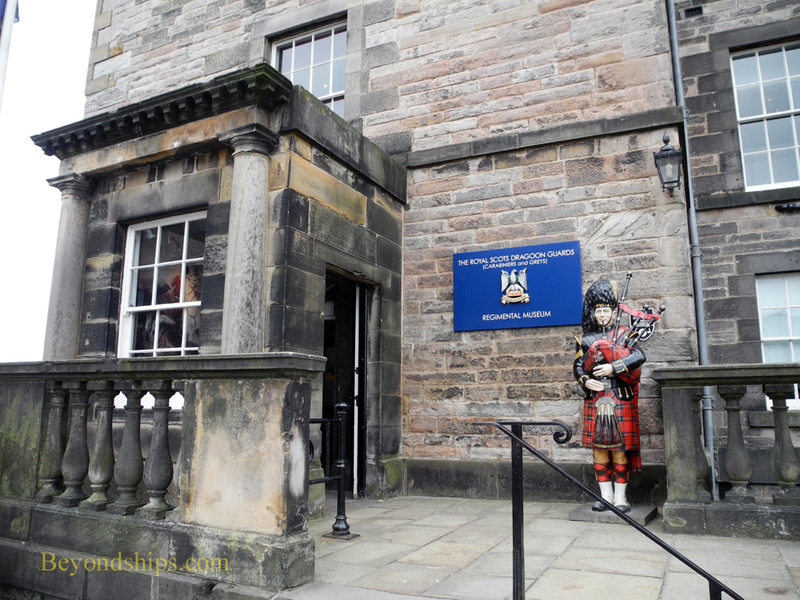 Two Scottish regiments, the Royal Scots Dragoon Guards and the Royal Scots, also have their museums in the Castle. A portion of the Castle has been set aside to honor man's best friend. 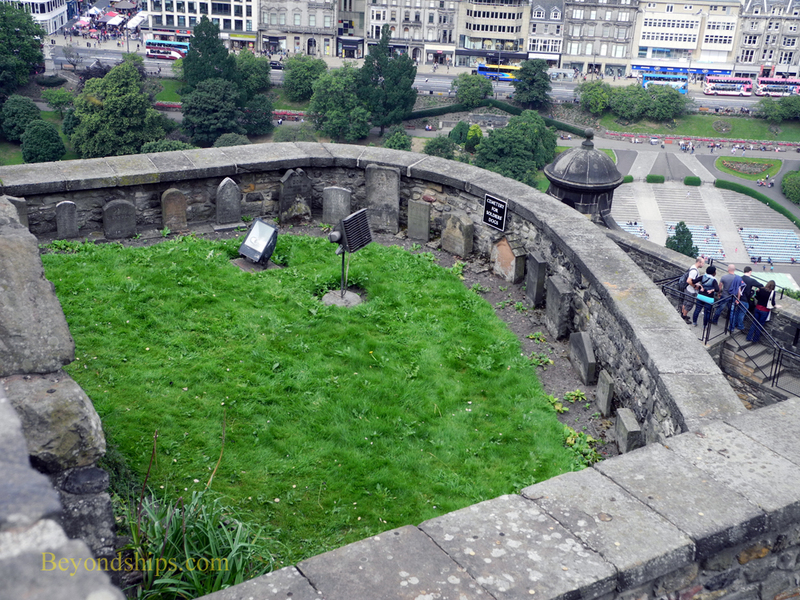 The Dog Cemetery, started in the Victorian era, holds the remains of regimental mascots and officer's pet dogs. Due to the fact that the Castle is perched upon a rock that towers over the City, there are panoramic views from its battlements. Indeed, on a clear day, you can even see the Forth Bridges near where the cruise ships dock.